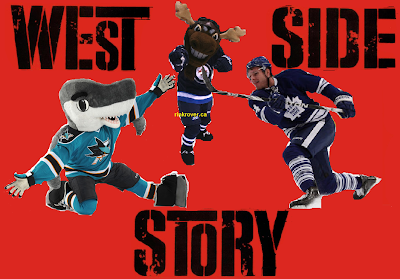 Rink Rover: Chasing Cody: What Does Franson's Every Move Mean to His Contract Negotiations? 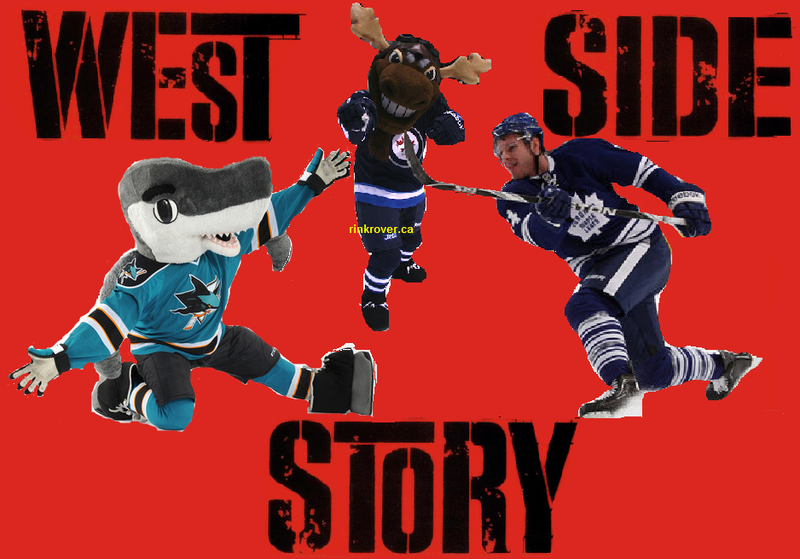 Chasing Cody: What Does Franson's Every Move Mean to His Contract Negotiations? Yesterday, my off-season hibernation was disturbed by a blurb preceding a TSN video relating to the Toronto Maple Leafs. The teaser claimed, "Nazem Kadri says he's upset with the lack of progress being made with his contract negotiations." Like Cam Charron, I immediately thought, "Here we go: Kadri's going to outdo Grabo by blasting the Leafs for mismanaging players." Fortunately for Leafs nation (and unfortunately for bored writers) Kadri gave a rather ordinary interview. He didn't blast anyone, and he seemed rather wise for a young player when he discussed the situation. Basically, he's just biding his time as his agent and the Leafs' brass iron out the new contract. So the teaser was sensationalizing a rather unremarkable interview in order to get views. That's understandable at this time of year, but I'm not sure if it works. To test out whether or not overstating the significance of mundane happenings garners any interest, I've put together a series of conclusions that can be gathered after stalking Cody Franson for a day. 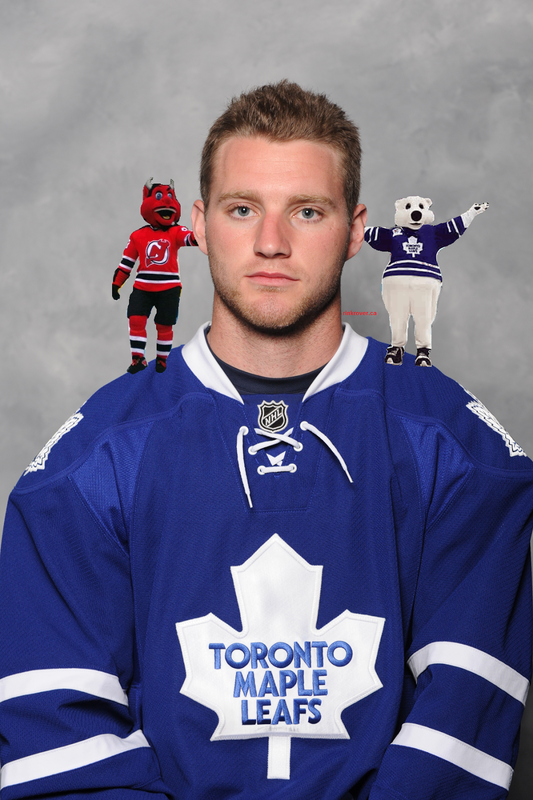 7:55 AM: By waking up in his native Sicamous, BC, Cody Franson fuels rumours that he may play in blue and white but his heart is really wearing the blue and green of the Vancouver Canucks. 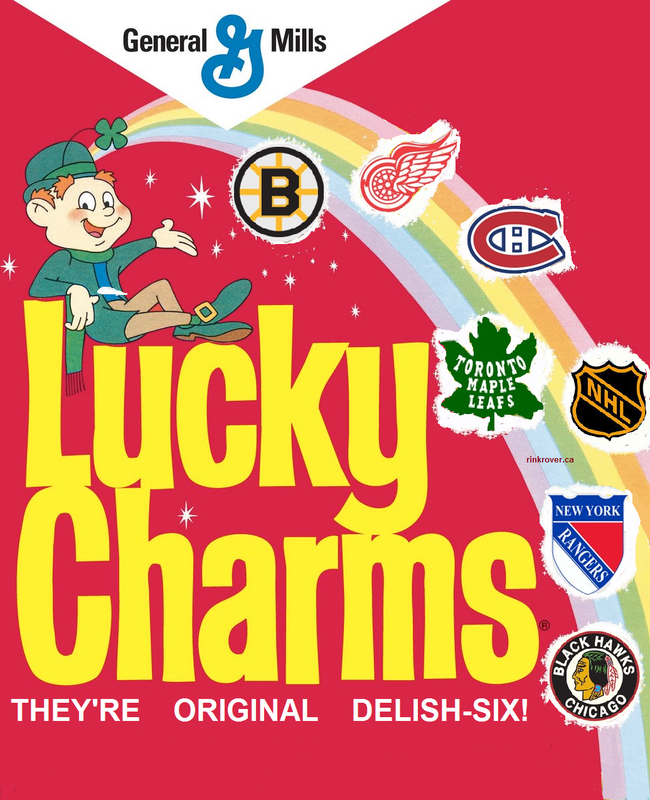 Speaking of "Lucky Charms," how has there never been an NHL tie-in like the above? 10:06 AM: Franson follows physical with mental exercise. While reading a selection from John Donne's Devotions Upon Emergent Occasions, he scribbles the following pun in the margins: "No man is an Islander entire unto himself." 10:44 AM: While getting ready to run errands, Franson sets his iPod to a playlist featuring only blues tunes by Big Bill Broonzy (or, if you will, Bruins-y.) His selection of music might also mean that he's contemplating a move to St. Louis. 11:37 AM: Franson complicates the previous rumour by repeatedly listening to The Supremes' "Where Did Our Love Go?" while driving to Chapters. Listening to Motown would suggest that Franson is interested in joining the Detroit Red Wings, but the song in question implies that Cody might just be feeling some heartache over contract negotiations with the Leafs. 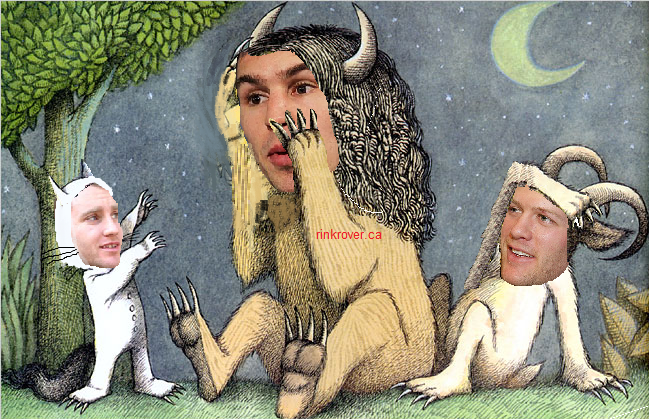 12:11 PM: While browsing books at Chapters, Franson pauses in the children's section to re-read "Where the Wild Things Are" while snuggling a stuffed monster. Did Franson choose this book to help him imagine what it would be like to play for the Minnesota Wild alongside Zach Parise and Ryan Suter? 12:41 PM: Franson browses controversial histories of the American Civil War--perhaps in preparation to sign an offer sheet extended to him by one of the NHL's Civil-War themed teams: the Calgary (formerly Atlanta) Flames and the Columbus Blue Jackets. 1:07 PM: Franson meets up with a friend for lunch. Franson orders Tropicana orange juice and (using a flask of Russian Standard vodka concealed in his jacket) mixes up some screwdrivers. These actions obviously reveal that the cash-strapped Franson is willing to undertake extreme measures to overcome financial constraints. Based on his surreptitious adulteration of Florida orange juice, it's possible that he might sign a long-term, cap-friendly contract with either the Tampa Bay Lightning or Florida Panthers and then abscond with either team to the KHL. 1:22 PM: Franson orders poutine (Montreal Canadiens?) and pays extra to have Buffalo wings (Sabres?) on the side. 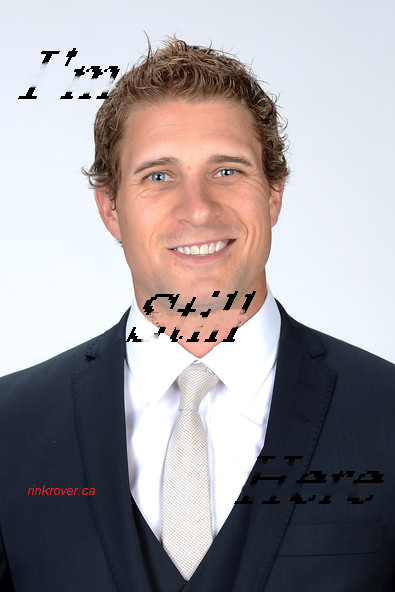 1:30 PM: Franson's friend asks him if he's seen a parodic photo of fellow defenceman Liles following the Leafs' decision not to buy him out in order to free up more cap space for Franson and Kadri. 1: 43 PM: Franson goes to the men's room and uses a urinal rather than any of the three stalls (or should we say "Staals," Carolina?). 1: 46 PM: While washing his hands, Franson has a moral dilemma. Should he listen to his conscience and re-sign with the Leafs, or heed his impish id's desire to sign a more lucrative contract elsewhere? 1: 54 PM: Franson is delighted that his friend hasn't forgotten his birthday (August 8th). When he returns from the washroom, he finds a cupcake and a Burger King crown waiting for him. (Too bad you didn't think of courting Cody with a BK crown, LA Kings!). 2:07 PM: After noticing a barrage of tweets asking him what his daily routine means in terms of his RFA status, Franson responds by tweeting, "FOR THE LAST TIME, I'M NOT TRYING TO DROP HINTS ABOUT MY CONTRACT NEGOTIATIONS!!!" Thus Cody fuels speculation that he is considering an offer sheet from the Washington Capitals. 2: 27 PM: After deciding to take in a matinee, the friends settle on seeing the local theatre company's revival of West Side Story. It's not insignificant that this revival designed the Sharks and Jets gangs after San Jose's and Winnipeg's NHL franchises. 5:13 PM: On his way home, a nosy reporter pesters Franson about his supposed involvement in a recent Sasquatch sightings in BC. Franson reiterates that he did meet with a Yeti, but his interactions with the abominable snowman were simply a matter of business. 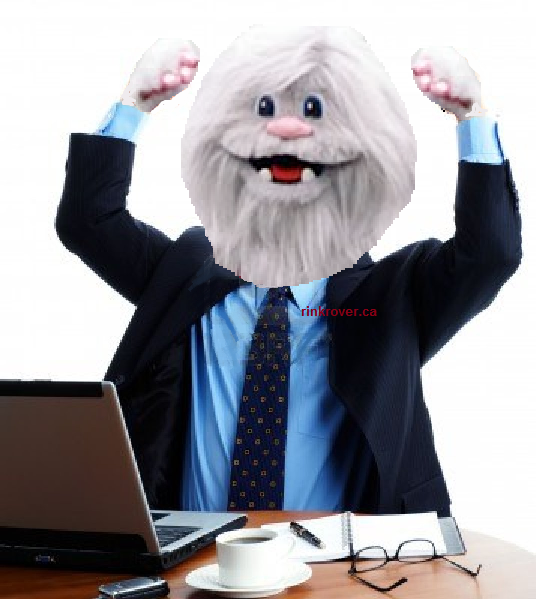 When Howler the Yeti stepped down from his position as the Colorado Avalanche's mascot, he joined the organization's managerial staff and eventually gained the position of Assistant General Manager. 5: 38 PM: While driving home, Franson sings along to "Our House," "Woodstock," "Teach Your Children" and other songs from the album Deja Vu by (Sidney?) Crosby, Stills, and (Rick?) Nash/Nash(ville). 6: 21 PM: Franson arrives home, picks up his mail, and discards all the flyers. (Tough break, Philadelphia). 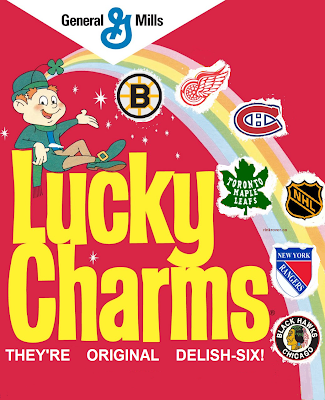 6: 47 PM: Franson sits down for a light meal of Swedish Berries. Does his confectionery meal mean that he's considering the possibility of re-signing with the team he played for during the 2012-13 lockout (Brynas IF Gavle of the Swedish Elite League)? 9: 28 PM: After some evening exercise, Franson talks to another friend on the phone. The two decide to meet up for coffee tomorrow. Franson, rather tellingly, suggests that they meet at Stan Mikita's (the fictional doughnut shop from Wayne's World) rather than Tim Horton's. This slip of the tongue (one that revives bitter memories of Mike Myers selling out his loyalty to the Leafs by setting Wayne's World in Illinois and making Wayne and Garth fans of the Chicago Blackhawks in order to appeal to American audiences) implies that Franson is entertaining the idea of betraying the Leafs to play for the 'Hawks. 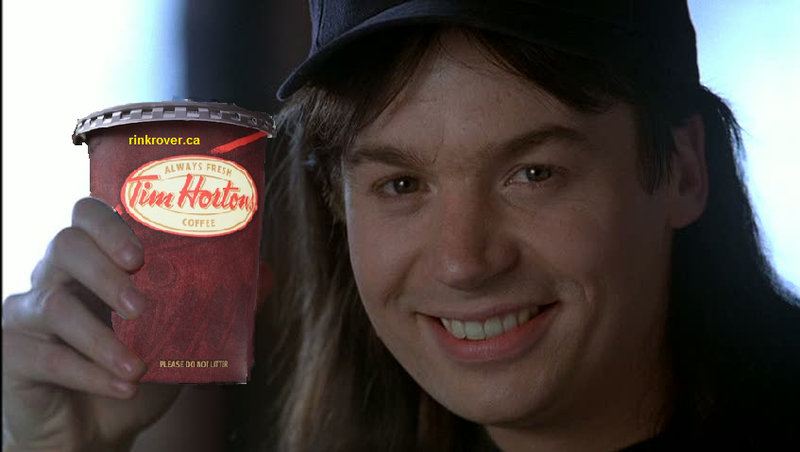 Pictured: a re-Canadianized scene from Wayne's World. 11: 17 PM: By going to sleep in his BC residence, Franson further fuels speculation that he wants to be traded to the Canucks.